Having established himself as a titan in the world of food writing, Michael Pollan’s most famous works are about the food we eat: where it comes from, why it matters. 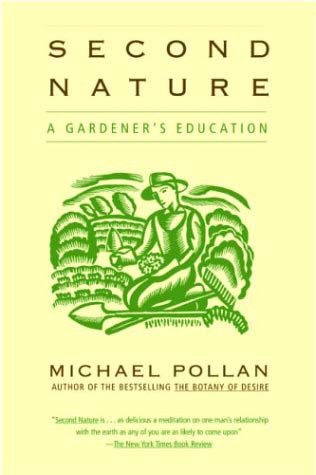 But Second Nature: A Gardener’s Education by Michael Pollan focuses on gardening – as art, as sustenance, as culture. The book goes back to Pollan's childhood experience with gardening - both on his own and in the shadow of his grandfather, who was a dedicated and prolific gardener. It follows him through the establishment of his own gardens (flowers and vegetables, as well as trees) on his own property. I was happy that composting was featured in the book as well. We have two compost areas in our yard in addition to several bins. Getting the chickens last year has helped the compost area become more robust, since they are prodigious waste producers. It's hard to think of compost as a "way to give back what we have taken," as Pollan describes it, when you mostly see a pile of pine shavings and chicken waste, but on the microorganism level, it is definitely true. The statement in the book that resonated most with me was that "improving the land strengthens one's claim to it." As of this weekend, we have lived in our house for two years. We've started gradually turning it into a homestead - which to me is that exact feeling: this is my land and my home, so I will work to be a good steward of it and the resources it provides. This is not a book that will give you step by step guides to gardening. Rather, it's a pleasant and almost lyrical philosophical examination (interspersed with lots of interesting facts) of gardening that if nothing else makes you want to go out and put your hands in the dirt.